Canadian Blogger: Hey Mr. Jim! Terry. I am glad that the sisters could get together like this. I thought I might have to ask you for an organization chart but I think I got it straight. They are a nice family. I missed Dad Golden, was he upset at something and stayed home? Really, I hope he is okay. Dad Golden with his favourite daughter. But.....Betty, Sandra, Gracey, Gail, Karen and me are ALL his "favourite daughter"! Although Dad Golden was married to the prettiest waitress in the Blue Star, he has never been one that likes to dine out. He is truly a home body, but he did leave the apartment long enough [after he had given everyone an ice cream stick], for me to snap a picture of him with his two girls, and Bernie! 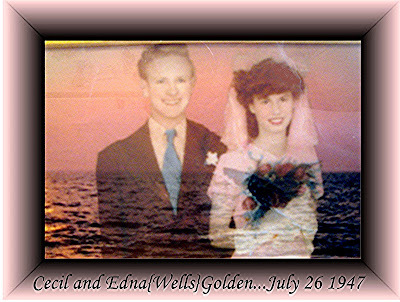 Tell Dad Golden I can see from his wedding picture, he's still got that royal look, but that he has got even more huggable as years has gone by. he still rules the family clan. My Daddy was a homebody too...i sure am missing him right now. What a blessing that you still have yours to spend such times with! Family fun! I love it when my family gets together as well! Great conversations, memories and pranks! We are loud to be sure and run off respectable folks! Wonderful pictures Terry. Hugs to all of you. its always such fun to see your family shots....still praying for our DAD Golden.